Sisters with Stuff: Best way to Reheat Pizza without using the Microwave or Oven! Best way to Reheat Pizza without using the Microwave or Oven! 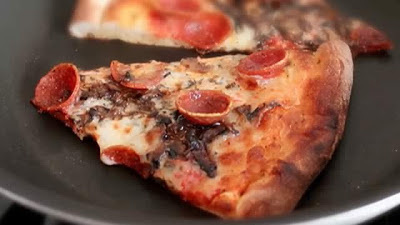 This tip will change your life forever, if you have ever tried to reheat cold pizza you know that it never turns out just right, if you reheat it in the microwave it's either soggy or so hard you can't chew the crust. If you reheat it in the oven it takes forever and the crust starts burning before all the cheese gets melted all the way through. Here's what you do: use a regular fry pan on the stove top and NO OIL on medium heat. There should be enough residual oil left in the crust to keep it from sticking, heat until it's warm all the way through and the cheese is melted. Voila', the crust is crispy, cheese is melted, what more could you ask for!